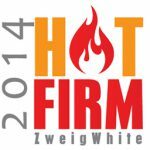 Baseline has earned position #38 on the 2014 Hot Firm List. ZweigWhite’s annual List is an exclusive ranking of the 100 fastest-growing architecture, engineering, planning and environmental consulting firms in the United States and Canada. Rankings are based on the highest percentage revenue growth and dollar revenue growth over a three-year period compared to other entrants. Baseline was the highest ranking Colorado-based firm to make this year’s list.